You won't miss the second slice of bread when you try these open-face sandwiches with slow roasted roast beef, au jus gravy and French fried onions! Toss meat with gravy in medium microwaveable bowl; cover with paper towel. Microwave on HIGH 50 sec. or until meat mixture is heated through; stir. Place 2 bun halves, cut-sides up, on each of two serving plates. 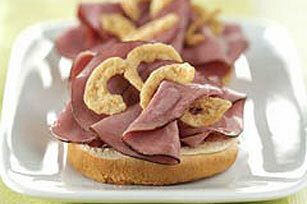 Top evenly with horseradish sauce and meat mixture; sprinkle with onions. Substitute chopped fresh onions for the French fried onions. Prepare as directed, using 1/4 cup canned beef or mushroom gravy plus 1 Tbsp. milk in place of the au jus gravy. 2 servings, two open-face sandwiches each.